You can use a bullet journal even if you don’t like drawing or don’t have time to create elaborate setups. Here are simple bullet journal tips including how I use mine. I don’t have time to draw and decorate all of the pages – check out the new done for you bullet planner!!! I’ll never be able to keep up? When you look at Pinterest or Instagram you see all of these beautifully drawn pieces of art that people use as their planner and think “I could never do that.” So many people decide to start a bullet journal, buy the supplies, and then feel intimidated and give up, often without even starting! Maybe you are one of those people afraid to write on the first page of your journal. 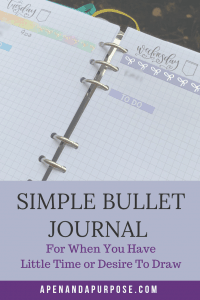 What if you could create a simple bullet journal and have that be ok? I admit, writing on the first page of a brand new journal can be intimidating. You just have to do it. You have to let go of perfection and go for it. You also don’t have to have a ton of time to set up a bullet journal. I don’t know about you, but the thought of drawing out all my weeks and months sounds terrible. What attracted you to bullet journaling? Was it the pretty pictures on Pinterest or Instagram? Was it the flexibility allowed by creating your own pages? You don’t have to be like everyone else. You don’t actually have to have an amazingly artsy bullet journal for it to fit your needs. 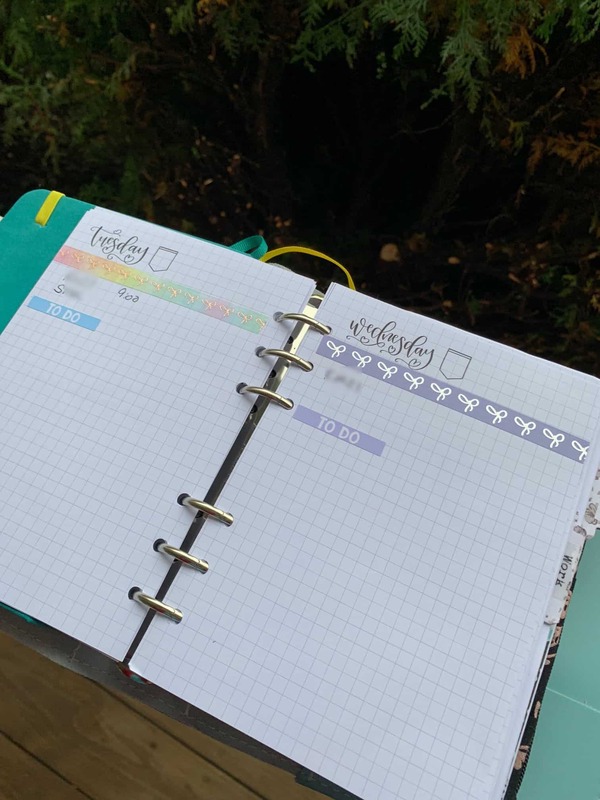 A simple bullet journal setup is the ideal bullet journal for beginners and advanced planners who do not have the time, skill, or maybe desire to do all that stuff. Ask yourself what draws you to the idea of bullet journaling. For me, it felt like a different way to organize things. In my daily life I need more lists and less appointment scheduling. I bought several planners in the past that felt too constrained. My job involves the same exact meetings every week and then I often travel between different places without a set schedule that day. Having a full day of a schedule just doesn’t fit. Using a bullet journal fixed that for me because I don’t have to try to fit my life into someone else’s idea of what it should look like. I also like a bullet journal for moments of mindfulness. I like to make lists and keep track of things. I love paper and pens and find journaling a great way to use the things I love. But I don’t like drawing. There, I’ve said it. I want to like drawing. I want to be good at drawing. I’ve purchased a bunch of courses on drawing. But I find it tedious, especially when I have a lot of things to do. When I draw something, I feel like it takes forever. So I thought maybe I can’t bullet journal. But that’s crazy talk. When you look at what a bullet journal is, how it originated, it didn’t’ start out as a fancy piece of artwork. It started as a way to allow a person to log things from their days in a quick way. It was meant to not be overwhelming. It was meant to be quick, something you would stick with. Check out my post on starting a bullet journal. I don’t know about you, but I can’t stick to something if I have to spend hours preparing for it each week. I just don’t have time for that. And I don’t like doing it. I don’t like drawing the boxes and all that stuff. I’ve purchased stencils and other items to help me draw spreads, but it just isn’t my cup of tea. Instead, I like making lists, writing stuff down, using washi and stickers. I don’t want to draw my own things. I want to make something quick but pretty. It may not fit with all of the Instagram versions of bullet journals, but it doesn’t matter because it is mine. It works for me. I’m going to share with you the setup I find helps for my bullet journal and then how I make it pretty. What Do I Use For My Bullet Journal? My bullet journal is kind of a hybrid. 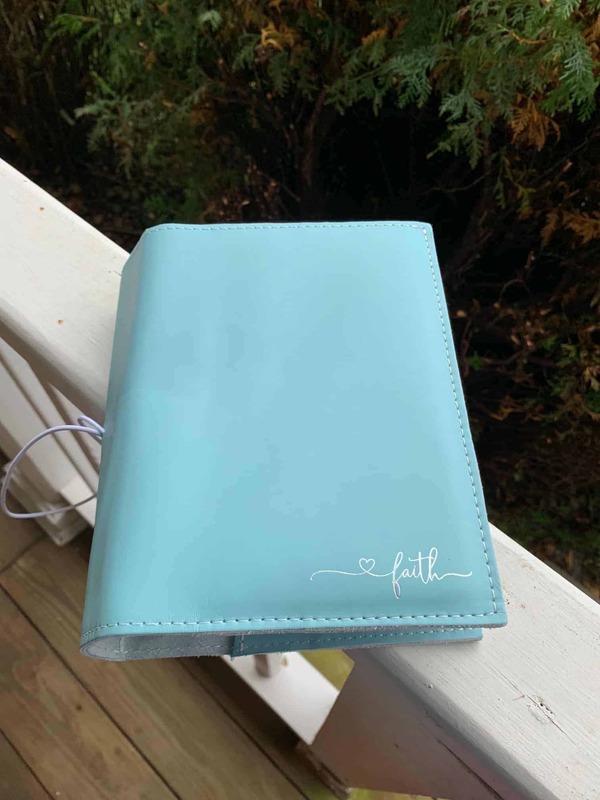 It is a mixture of a ring bound planner and bullet journal notebook. First, I use a Foxy Fix ring bound planner to keep everything in. They recently came out with an elastic bound planner which I find works best for my needs. I like the Personal Wide size, which is pretty close to B6 (5X7 inch paper). The size is just right for me. It isn’t tiny, but it isn’t huge either. I use a ring bound notebook because I want to be able to remove pages if need be. I need to take notes and I don’t want to carry around a separate notebook for my notes versus my planner. Previously I tried to use my notebook for work notes and planning but found I had a hard time writing down what I needed because I didn’t want to mess up my notebook. Most of my notes are not things I want to keep. Actually many of them I can’t keep for professional reasons. I need to be able to shred them. So keeping them in a bound notebook didn’t work for me. Instead, I make my own pages for my ring bound planner. I print them using printables I purchased online as well as ones I’ve created myself. I use this amazing, smooth, thick paper because I love writing on it. It handles all of my pens, including my favorite flexible nib fountain pen, which writes very wet. I print out whichever pages I want, cut them with a paper cutter, punch holes in them and stick them in my Foxy Fix. Since I use the personal wide size of Foxy Fix, I use this hole puncher to get the correct size. The front cover of my Foxy Fix Elastic Closure Personal Wide Ring Binder has a vertical pocket that I stick the front cover of my B6 sized journal into. Note: this will only work with the elastic closure ring binders, not the ones with the snap closure. The elastic ones have a little more room in them. 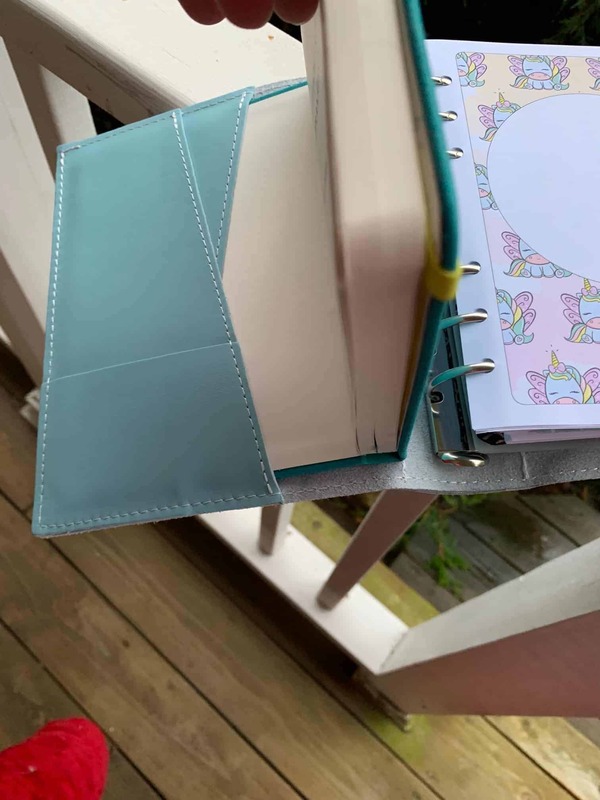 Here is my review of the hardbound dotted notebook I use for my bullet journal. My current setup includes a few different sections that are separated with tabs. In the front of my planner I have my dailies and master to do lists. Each day has its own page in my journal where I write the appointments for the day and the top things I would like to accomplish that day. I then prioritize my tasks using the method I wrote about in this post. To be honest, I initially decided to use dailies because it allowed me to use a different washi tape every day. I love decorating with washi and stickers. It motivates me to look in my notebook, which helps me to get stuff done because then I am reminded of what I have to do. As I mentioned, I have a master to do list. I keep this near but separate from my dailies since it doesn’t make sense for me to have 100 things on my daily list if I can only reasonably complete 3-5 items with everything else going on. The master list allows me to capture things I have to get to but maybe not right now. After my dailies, I have a tab called “work.” This is where I take work notes. This might include phone messages, meeting notes, or details I need to follow up on. As I mentioned earlier, I love having pages I can remove for this stuff. I don’t need to keep my phone messages for longer than a day or so, so I can declutter by shredding these after I take care of them. The next tab of my notebook is called “blog.” This is where I write down actionable items for my blog. I write down ideas for blog posts, things I learned on podcasts, keywords to target, and so much more. I like having this separate section so I can focus my mind on my blog when I have some time (such as during lunch hour). The last tab is called “Personal.” Personal stuff can include anything I want it to include. Some examples might be a journal entry, a list of some sort, things I want to remember, or handwriting practice. The sky is the limit. My pages are removable so I can do whatever I want. Nothing is permanent. For things I want to keep I have a traditional hard bound notebook attached to the front cover of my notebook. I’m so excited I found a dotted B6 notebook which perfectly fits in the cover of my planner. This is where I keep my collections and anything else I’m tracking. For instance, I have pages on subscriptions I have, courses I’ve purchased, Netflix shows I want to watch, weight loss, and things that make me happy. These don’t change and I want to keep them with me so they are perfect in the hard bound planner. Another thing I like to keep with me in the hard bound planner of my bullet journal setup is an ongoing list of things I’ve learned each day, whether from the lessons of hard knocks (haha) or from podcasts or courses. It is fun to look back and remind myself of those things. I mentioned above that I don’t like to draw. Man, I tried. I wanted to like to draw. It seems like you “should” draw if you are going to use a bullet journal. Worse, it seems like you “should” like to draw if you are going to write about bullet journaling! Instead, I decorate with washi and stickers. My favorite washi tape is from Simply Gilded, and I highly recommend getting on the list and signing up for her subscription box. I also have some other washi tapes I’ve purchased elsewhere. I like this brand here. I also enjoy using stickers. I tend to pick stickers that either are representative of what I am writing about (such as a girl with a computer for blogging) or that represent the mood I’m in. I’ve also used stickers to write things such as “to do.” Here are some of my favorite sticker shops. I hope my setup is helpful to you. The point though is you need to find something that works for you. It has taken me awhile to figure out what my favorite setup is, but once I did things came together for me. Whether you like to draw or not, bullet journaling can be for you. AND you can be proud of how your bullet journal looks even if you don’t have hours to prepare each month.